Opposition politician Yevgeny Roizman, who won Sunday's mayoral vote in Yekaterinburg, was scheduled to be questioned by investigators Tuesday as a witness in a criminal case against a former employee of his City Without Drugs foundation. Roizman, an outspoken critic of the Kremlin, was one of the few opposition members to win a mayoral seat during Sunday's regional elections across Russia. He was the candidate for Mikhail Prokhorov's Civic Platform party. In the run-up to the mayoral vote, Roizman was questioned by law enforcement authorities in connection with multiple inquiries, in what he said was partly an attempt to blacken his name among voters. Tuesday's scheduled questioning was in regard to a case against Yevgeny Malenkin, one of the former heads of City Without Drugs. Malenkin is accused of illegally detaining rehabilitation patients at one of the foundation's facilities. A lawyer for the foundation, Anastasia Uderevskaya, told RIA Novosti that Roizman was also scheduled to be questioned Wednesday in connection with a case opened after Roizman complained that his phone had been tapped. A representative for the local branch of the Federal Security Service denied that such an interview was set for Wednesday, however. Roizman received just more than 30 percent of the vote in Yekaterinburg's mayoral election, compared to 26.5 percent for his nearest rival, Yakov Silin, who was backed by United Russia. The city's elections commission is scheduled to hold a meeting Thursday at which it will formally announce the winner. Roizman is openly opposed to the Sverdlovsk region's administration, and analysts have warned that a feud between City Hall and the administration could paralyze local governance. On Monday, Roizman immediately fired shots at two major initiatives backed by the regional government — a bid to stage the 2020 World Expo in Yekaterinburg and the hosting of four matches of the 2018 FIFA World Cup soccer tournament. 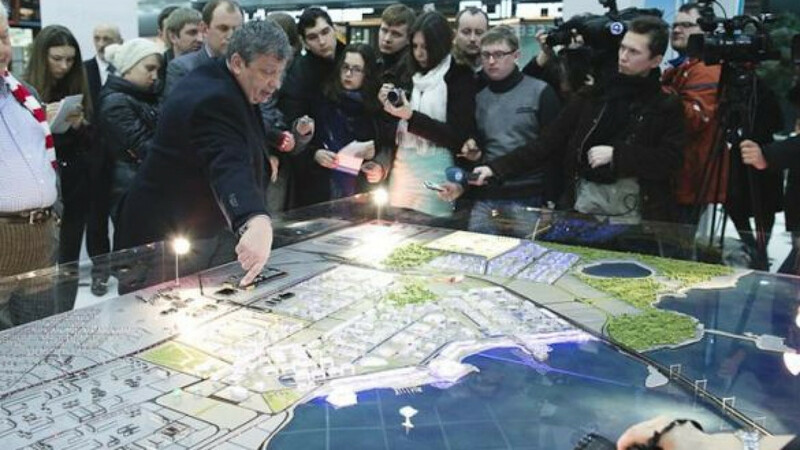 Roizman said that the World Expo — a large public exhibition held every five years — would be a positive event for the city but added that so far it could only be viewed as an effort by the Sverdlovsk governor to carry on his predecessor's populist measures. "If Yekaterinburg's main rival, Dubai, says that it will build another 500-meter-high skyscraper, while our top news is that a horse has been stuck in a well, then what else can we say here?" Roizman said at a news conference that followed his election victory, RIA Novosti reported. He was even more skeptical of the benefits Yekaterinburg could gain from hosting four World Cup matches in 2018. "It's fully possible that our citizens will be forced to finance this endeavor," he said. "We have to think carefully about this. Are we ready to spend 15 billion rubles [$453 million] to host four football matches? … This project can potentially be subject to corruption." Many Russian cities were competing to host the 2018 World Cup, and 11 made the final cut. Supporters of the bids say local economies could get a boost from the lavish investments in infrastructure. Correction: Due to an editing error, an earlier version of the story said that the number of World Cup host cities is 13. The correct figure is 11.